This diet will help to improve your concentration, will significantly reduce the possibility of occurrence of various cancers, can help fight depression and improve overall health. 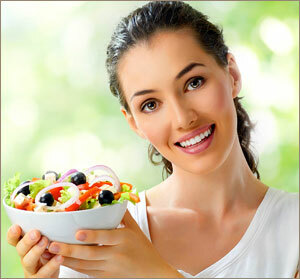 “Healthy diet” is the diet that not only removes excess fat tissue, but also contains a lot of nutrients. Need advice: what can I eat and what I should avoid? Tuna, salmon, herring, mackerel is a very oily fish is excellent and is one of the main components of this diet. – Nuts, peas, beans – they are sources of vegetable protein. Huge amount of fresh fruit and vegetables a day (preferably fresh vegetables with green leaves, as well as any fruit, but low in sugar). – Olive oil extra class (eхtra virgin), Flaxseed or rapeseed oil (exclusively cold pressed) – various valuable fats that should not be used for stir-frying dishes, as they burn very quickly. – Soy, sunflower and corn oil is dangerous kinds of fat, which you should avoid. – Dairy products with low fat content. – It is recommended to use exclusively lean meat, such as indusia breast without skin that will give you the opportunity to avoid the various saturated fatty acids. – Forbidden foods are fried in lard. – It is undesirable to use margarine. – Not to consume various pastry products and cakes, chocolate bars, crisps and snacks factory production. This diet is considered one of the best well balanced, it relies on the long experience of the Eskimos, constantly provides you a large number of different minerals and vitamins, fiber, antioxidants, salicylates needed low immunity or the common cold (berries, drying, tea). С 1998 года медцентром управляет ее главный специалист Поленов Вячеслав Алексеевич, пластический хирург, входит в комиссию ОПРЭХ, специалист в области лазерной медицины, лауреат премии Золотой Лацент.